You escape for 10 minutes. Well it’s probably an hour but it only ever feels like 10 minutes! Then you are brought back to realty with the stretch of an arm or a look across a room sprinkled with gifts from kind, beautiful souls. My current chemo drugs keep me laying low for about 10 days after treatment day. Between the actual chemo drugs couple with the anti-nausea drugs I almost feel like I’m existing out of my body — viewing my life from the ‘outside’. My kids think I look a bit angry — I think it’s the steroids that dilute my pupils to the size of a full stop and add that to the fact I have very few eyelashes and eyebrows left and it all combines to make me look pretty ghostly at times. For those 10 days I struggle to rest. I know I have to and my body craves it but the steroids keep my body pumping and whenever I take the chance to lie down the horrible thoughts and reminders flow through my veins quicker than the drugs go in! My mind can’t rest. I lie down and memories of the day, week, month before come flooding back and exacerbate the nausea. I picture the needles going in, the blood going out, the poison pumping through my veins. 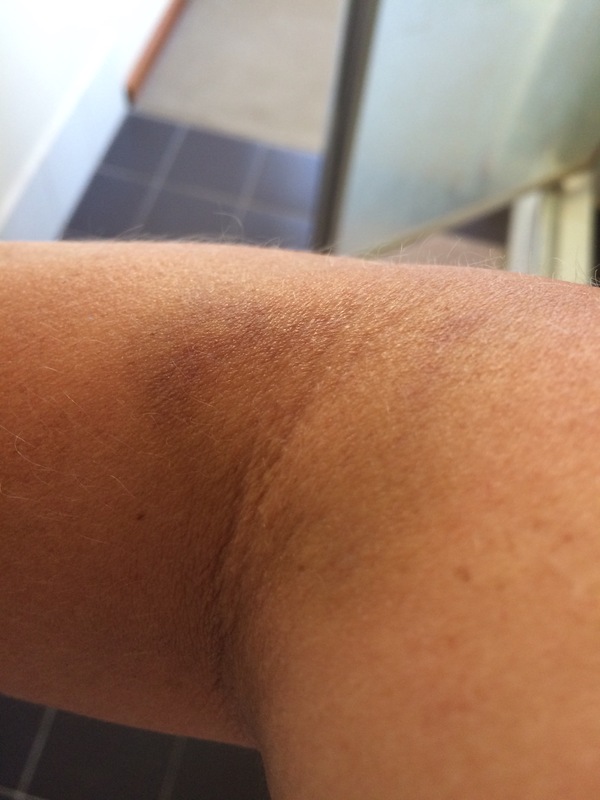 The bruises on my arm remind me of treatment day and the blood tests before treatment day and now vein cording reminds me of the battering my left arm has taken since October. My poor old left arm — it’s been used for 99% of blood tests and 100% of chemo treatment. My right arm is downright not interested in this whole process and has given a couple of drops of blood before shutting down and forcing carers to my left side. Some people have a lazy eye – I have a lazy arm! The vein cording, a new phrase I have learnt – was worrying me as I thought perhaps it was something to do with cancer in my lymph nodes – but Professor Chan was adamant my veins were just ‘tangled’. I can’t straighten my arm and it hurts when I reach for something. So off to the physio I need to go! Other daily, hourly reminders of my life since October 2014 reflect the kindness of the human spirit. I have been given some beautiful gifts. While they remind me of my daily struggle, they also shout to me through my sometimes blurry silence, that people care — some I have known since was born and others I have met in the past 18 months. 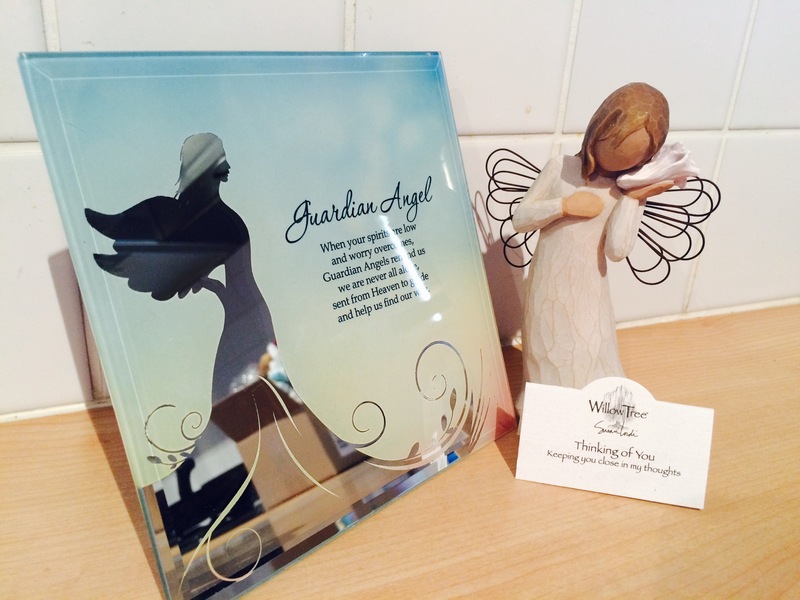 My amazing long-distance cousin sent me a beautiful angel to watch over me, while one of my gorgeous school-mum friends gave me a guardian angel plaque. I cried like a baby when I opened both gifts — but they are constant reminders that I am not alone — my family and I are surrounded by incredibly generous, thoughtful people who just want to help put a smile on my face even just for that single moment each day when I look across the room.